In movies like the recent Searching for Sugar Man, the performer endures suffering to succeed. An ordeal is rewarded with success. The ordeal is the rite of passage. Leave it to the Coen Brothers to give us a story of unrequited suffering at the alter of art—and to depict it as a metaphor for human existence itself. Great talents can be rewarded with money and fame but the average individual labors his whole life only to come to a miserable end. 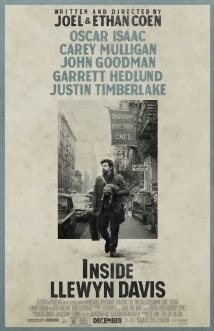 Loosely based on folksinger Dave Van Ronk's, The Mayor of MacDougal Street: A Memoir (written with Elijah Wald), Inside Llewyn Davis turns the idea of artistic redemption upside down. The movie ends right where it started- with the regurgitation of the same beating it records in the beginning--and succeeds in recording little or no progress in the plight, of its albeit feckless protagonist. The Coen Brothers display their usual knack for framing gargoyles. The camera zooms in on the garishly good-willed wife of a Columbia professor, Lillian Gorfein (Robin Bartlett), as she discovers that Davis has failed to return her cat. Davis (Oscar Isaac) sings his heart out to Bud Grossman (F. Murray Abraham) a Chicago impresario, only to be told “I don’t see a lot of money here.” Davis's father Hugh, confined to a nursing home with dementia or Alzheimer’s, stares out blankly as his son sings for him. For a moment, you think the music has moved him, but it turns out it’s only moved his bowels. Though the settings display an almost intentional factitiousness (iconic locales like the Café Reggio are cited, but don’t convey an unobstructed early 60’s feeling), the effect of the warped universe of the movie is that of waking up to a nightmare. A typically lyrical Coen Brothers shot of snow falling across a lonely road is fractured when Davis's car suddenly hits an animal. It’s almost as if the movie were exhausting itself in its pursuit of gloom. It’s like the old saw about boredom. You can write about it, but don’t be boring. The loss of the Gorfein’s cat takes up a good portion of the narrative and yet what message is being conveyed? That the hapless Davis is not very good at handling strays, “Hang me oh Hang me...wouldn’t mind the hangin...but the layin in the grave so long,” Davis sings. But the character the Coen Brothers have created is not so much dark as colorless. However quietly desperate, a life need not have significance. Unfortunately, in order to justify its existence a film about such a life is forced to raise the bar.